I took my new PSN-10 for a ride and had a hell of a time using the downtube shifters. I'm sure that over time I could get used to it, but frankly I'm so used to the convenience of bar shifters that I think I'd rather just do a conversion. I know I can get cable stays that screw into the downtube braze-ons and provide the adjustment point for new cables leading up to the bars, but that's about where my knowledge ends. first -- love the new bike. at the risk of sounding like an enabler, you did the right thing. because your setup is 6-speed, your rear spacing is 126mm. current standard spacing is 130mm for road bikes. you could easily switch to this but you would have to buy a new rear wheel/hub setup. now, to answer your main question about brake/shifter combos (sometimes called "brifters") with your current drivetrain....bookmark this page. it's a crib sheet from sheldon brown's site with all sort of drivetrain spacing on it. because all current brake/shifter combo units are set up for indexed shifing, you will need to get shifters that are set up for the spacing of your freewheel. as your current freewheel has a spacing of 5.5mm, you will have to go with something intended for that spacing. 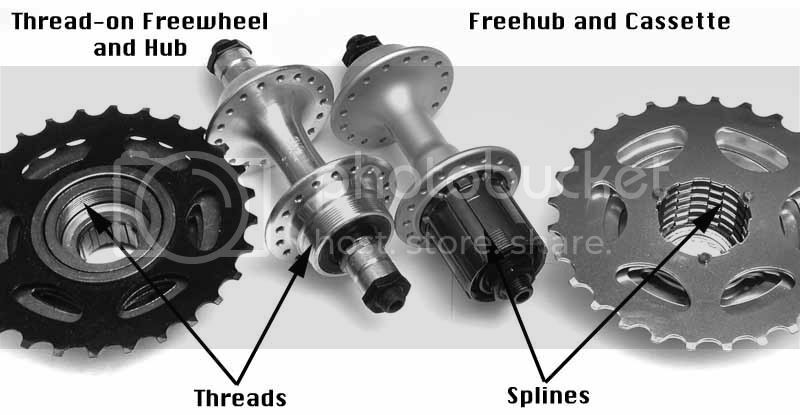 as you can see from looking at the freewheel/cassette spacing chart, most newer setups have tighter spacing than that (5.0mm or so) because of the larger amount of gears crammed into the same width (give or take 4mm). there are products out that that will let you use an older-style friction shifter on the brake lever but they're expensive; you're probably better off swapping out the rear wheel/hub, then your choices are limited only by your budget. Thank you this is a huge help. I've found a few references online to people trying to do the same thing I am. It looks like there's a decent chunk of change involved no matter what. I want to keep the wheels, but relacing those hoops onto modern cassette hubs isn't cheap. I'm wondering if I should just strap a small set of thumb shifters onto the bars and call it a day. both have their pros and cons; they get the shifting up near your brake hoods but neither is a true friction-shifted brifter. imho friction-shifted brifters may exist, but if they do they are a low-volume fabricated item (like paul components stuff) that's going to be so expensive that you're better off replacing the entire driveline. The Kelly take-off thing looks promising. Here's another thought I just had. The Shimano 105 group I have for the Galaxie has a 6 speed cassette (and it's an actual cassette), and the downtube shifters have a friction and SIS index mode, which leads me to believe it is intrinsically index shifter compatible. Since the Galaxie is the more modern "high tech" bike of the bunch, I wonder if I should invest in upgraded/modernized components for it and use the 105 stuff on this new PSN-10. So now I need to get the new cables, and I'll probably end up renewing the wrap on the bars as well. Hell, I may just replace the brake cables, hoods, wrap, and shifter cables and be done with it. Hopefully that freewheel stays reliable. NOS benotto handlebar tape (original to our bikes) runs about US$30 a set now. i remember buying it for a couple of bucks back in the 80s when i was a poor college student. fortunately the newer stuff is better and cheaper than that. i've heard that the supply of 6- and 7-speed freewheels is drying up, so you might want to keep your eyes open for NOS freewheels on ebay and grab a couple so that you have some spares. And as luck would have it, this particular PSN-10 has the unheard-of-ultra-rare Normandy helicomatic freewheel hub. If it ever needs replacement and I want to keep it stock, it wouldn't be sacrilege to use a Maillard since it seems Peugeot used both.